By land area, the Mongolian empire was the largest-ever empire. Its first ruler was Temujin, who later became infamous under the name, Genghis Khan. The Mongolian Empire lasted through the early 13th and early 15th century. The Mongolians were fierce, powerful warriors. They were proud horsemen and mounted archers. Genghis Khan died on a campaign to China in the 13th century, and was succeeded by his son. 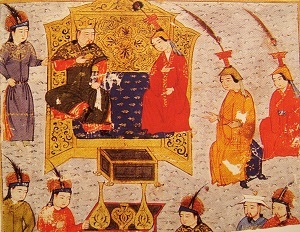 In 1260, a new Dynasty was made from one of Genghis Khan’s descendants, starting off the Yüan Dynasty. The Yüan Dynasty ruled over Mongolia and part of China. Over time, it overtook all of China. In further west Central Asia, an independent khanate was founded by descendant of Genghis's third son, Chagatai. This khanate stretched from modern day Kazakhstan to modern Uzbekistan and Turkmenistan. Genghis Khan's fourth son's descendant was the founder of The Golden Horde, comprising the western part of the empire. In the 14th century the Mongolians in western Central Asia assimilated into a larger nomadic Turkish population that then lost their original cultural identity. In the late 14th century, a Turko-Mongolian army commander named Timur tried to rebuild the Mongolian Empire. He united much of Central Asia, Persia and Mesopotamia, but failed to conquer China in the early 15th century. Timur was a brutal conqueror. After establishing his empire, he became a devoted Muslim. After he died, his empire fell due to poor provision and administration. With this information you can tell that the Mongolian Empire was powerful, expansive, and now, defunct.